As was reported this weekend by Re/Code and then Bloomberg, Microsoft made a number of management moves within senior leadership today. Former Skype CEO and Business Development and Evangelism EVP Tony Bates has left the company, as has Tami Reller, the former EVP for Marketing. EVP for Advanced Strategy Eric Rudder will assume Bates’ duties, and longtime Microsoft marketing guy Chris Capossela will take over as Chief Marketing Officer, a role he once held in a previous re-org. Capossela will retain his position as worldwide leader of the Consumer Channels Group (CCG) until that role can be filled. That’s one way of looking at it, of course, but it’s difficult to look at the moves Microsoft has made as being much more than a rearrangement of deck chairs. CEO Steve Ballmer is out (but he’s still on the Board and still owns the second biggest portion of Microsoft’s stock), replaced by longtime Microsoft loyalist Satya Nadella, who is surrounded by a senior leadership team (especially with the departure of Bates) of longtime Microsoft loyalists. It’s hard to imagine how this Microsoft is going to be very much different than the Microsoft of old, to be honest. 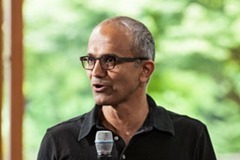 Perhaps that’s the point, as for all of its naysayers, Microsoft continues to rake in the profits, is intent on pursuing initiatives like Bing, Windows Phone, and Xbox, and is making progress in areas like Azure cloud services and a connected, service oriented Office. For anyone expecting wholesale changes in the way Microsoft does business, this should be a wake-up call. Microsoft has already made changes to their Senior Leaders page (Julie Larson-Green remains on the page and in her current role until Microsoft completes the Nokia acquisition and Stephen Elop is back on board), and we’ve updated our People pages, too.